Dogs? Fine yes, but see below. Hello! My name is Duke and I am as sweet and easygoing as I look! I loved my current dad. He and I were a very content couple of bachelors but one day he went into the hospital and wasn’t able to come back for me. After he left, his friends tried to take care of me but I really didn’t like their nosy little dog. So, I went back to dad’s place but it wasn’t the same without him even though my friends came to feed me and let me out twice a day. I was scared and very lonely all by myself in that empty house. Because I am a little older, I really prefer to go out to the bathroom several times a day, I ended up with a urinary tract infection and started going inside sometimes. Eventually, Rainbow of Hope and Horseheads Community Animal Shelter put their heads together and came up with a temporary plan! They have been caring for me and they took me to the vets where I got a clean bill of health. I do get a little worried about being left alone after everything I’ve been through – I would love a doggy door so I could get in and out when I get nervous and feel the urge (if you know what I mean). All I need now is a person that wants to share my golden years with me! I am kind, gentle, and easygoing. I never start or look for trouble with other dogs, but sometimes they take advantage of my good nature and get way too close to my personal space. When they do, I am not afraid to deafen them with my hound bark. However, I am a very quiet hound and rarely have to use my secret defense bark. All I want is to enjoy the companionship of my people. I particularly relish going on walks. 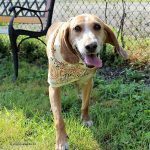 I am an excellent and gentle walker on leash, it is one of my favorite activities, kind of like reading the local newspaper – I can find out just about everything about everyone because I have an amazing hound sense of smell. I greet everyone on walks with a quiet demeanor and slow body wag. I guess I just trust that most humans are friends. I am excellent in the car and my Rainbow of Hope friend and I have a secret pastime: we love to go through the McDonald’s drive-thru and share french fries together! But don’t tell anyone I told you! 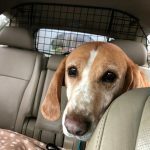 When she gets out of the car to pick me up from the shelter, I can’t help but give a slow-motion hound wiggle even though I know that’s puppy stuff – sometimes even a little bark or two comes out, but I just can’t wait to see what interesting adventure she has planned. I think it’s so relaxing to sit in her back seat and watch the world go by. In fact, I feel like this about people of all ages. What has attracted people to me is that I am so good with children that visit. I don’t jump on them or bark at them. I was even tolerant of this crazy guy who thought he was Santa Claus and wanted a picture with me (at my age I know Santa isn’t real). I appreciate kids who are old enough to be predictable and that are dog savvy. At the shelter where I live, they have a nice outdoor space that I enjoy when the weather permits, I am not a delicate house only dog, I know how to cool off in the dirt. Just because I am rugged doesn’t mean I am dirty or ignorant. I keep my kennel clean (number 2’s are for outside!) and I can sit for my food and Kongs. Oh how I love my Kongs with the yummy surprises in there. I love training treats too. Once, I tried to put my head in my friends treat pouch when she wasn’t looking– it got a little stuck and I accidentally pulled her pants down in front of some people!!! Hahaha! She acted so strange about that, oh well, the treats were delicious and now she keeps her pouch closed. I have gotten used to shelter life so I will need some reconditioning to trust that I’ll get to go outside often enough and I will need help trusting that you will come back for me. I think you could probably convince me with a regimen of well-timed, well-stuffed Kong deliveries. I think crates are unpleasant and much prefer a doggy door or help from my humans to let me out regularly as I am certainly not a silly puppy. I am wonderful with people and kids. I do prefer to live with kids 6 and older, since I don’t want to accidentally fall on a younger kid, plus I prefer a generally calmer home environment. I behave perfectly fine with other dogs, though do not seek them out for friendship. I feel just fine around dogs who are mellow and respect my personal space but must admit that I find it unpleasant to be around dogs who are hyper or yappy, who aren’t nice to me, or who are in my face (even if they have friendly intent). When faced with dogs like that, I will howl and bark my displeasure, but don’t try to hurt anyone. I would be grateful to not have to share space with dogs like that, whom I find unpleasant please! I’m great with cats! I’ve always liked cats and most of the places I’ve stayed have had them. I don’t necessarily want to share my bed and toys with them until I get to know them, but I am a “live and let live” sort of fellow. Human companionship! Love! Snuggles! Attention! Long outdoor leashed walks, especially on a trail or park! My dad was not able to come home after he became ill. I am healthy! I have several bumps and lumps like lots of dogs but my vet said that none are worrisome. My UTI is all better, I am vaccinated, neutered, on heartworm and flea/tick preventive. I might have a little anxiety at times when you aren’t around but I can cope if you help me with a routine, access to the outdoors, Trazadone, and Kongs. I am sweet, mellow and looking for someone who has time to share with me. I would love to go on walks with you, and to be your buddy for watching movies, hanging around, and going out to fun places. I would love someone who was middle aged like me, though since I am great with kids/grandkids, I could do well with an older or a younger person as long as they have time for me and aren’t always working and running around to their kids’ activities. A mid-day dog walker could even help make it work. Most importantly, my perfect match must loves french fries and has Kongs! Hahaha! 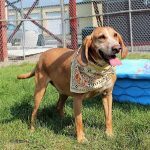 If you are interested in adopting Duke, please contact Susan at Rainbow of Hope Animal Rescue (contact info: 607-562-8085 sford@stny.rr.com) who will make all decisions about our adoptive placement. 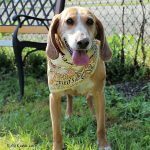 adult, good with cats, good with dogs, good with kids, hound, male, medium, neutered. Bookmark.